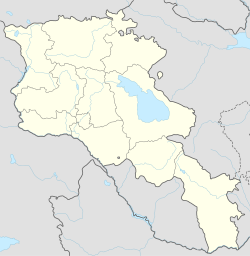 Artashat is a city in Armenia. It is on Araks River. Artashat is the capital of Ararat Province. The name is from Iranian languages and means the "joy of Arta". It was founded by King Artashes I in 176 B.C. Artashat was the capital of the Kingdom of Armenia from 185 BC until 120 AD. ↑ (Armenian) Tiratsyan, Gevorg. «Արտաշատ» (Artashat). Armenian Soviet Encyclopedia. vol. ii. Yerevan: Armenian Academy of Sciences, 1976, pp. 135-136. This page was last changed on 12 December 2018, at 18:54.